Elias Sayour, MD, PhD, had love and perseverance at the foundation of his childhood. As a first generation American born and raised in Brooklyn, New York, Dr. Sayour was taught the value of hard work and never giving up, seeing how his own father dedicated every ounce he had to support his family. If he hits a roadblock during research, he finds another path. “I’m using what my parents taught me to make the world a better place,” Sayour says. Dr. Sayour has two career paths. He is a physician and a scientist. 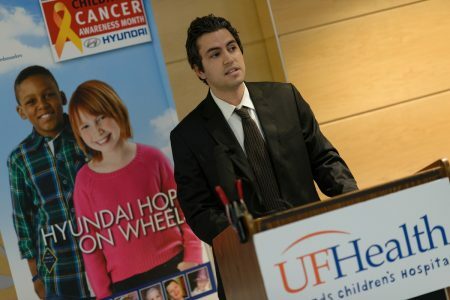 Dr. Sayour’s passion for caring for children with cancer began when he was a medical student. As he spent time with children and their families, he felt a love of practicing medicine, a feeling he had not felt with any other specialty. He was in awe of the providers caring for these children, but even more in awe of the children themselves. They became heroes to him, with their abilities to fight cancer with immense courage and smiles on their faces. In these heroes, he found a career in pediatric oncology. With a passion for patient care, research was not originally a career interest for Dr. Sayour. However, through his time as a fellow, the patients he could not save began to wear on him and he began to feel inadequate. It was in this troubled time that he met Duane Mitchell, MD, PhD, who spoke a different language, a research language of hope and inspiration. Dr. Mitchell spoke of understanding cancer through research and a belief in the immune system. This belief in the immune system was in immediate synergy with Dr. Sayour’s own belief in vaccines for pediatric patients. Dr. Sayour realized he wanted to learn how to speak this research language and deliver it to his patients. So, he went back to graduate school, received his doctorate degree and devoted his life to understanding cancer and developing more meaningful therapies. “The children have inspired me so much, I just want to give something back,” he says. His firm belief in the immune system and vaccines plays a large part in his research. Dr. Sayour’s ultimate research goal is focused on vaccines and how a vaccine can reprogram the immune system against cancer. While much progress needs to be made in this area, Dr. Sayour holds confidence in the immune system and its ability to handle a constantly shifting disease like cancer, much like it adjusts to viruses. Right now, he is working on a nanoparticle vaccine. He hypothesizes that nanoparticles can be used because they are small enough to act as couriers to the immune system that will deliver information telling the body that a tumor is harmful. Dr. Sayour is passionate about his research and fundamentally wants to make a difference in the lives of people with cancer. Through all of his experiences as a doctor and as a researcher, he values contribution to the cancer community the most. “I can’t think of anything more valuable than the care of a child with cancer,” Sayour says. In addition to loving the work he does, he also enjoys the collaboration with his colleagues. The collaboration and support at the University of Florida has been unlike anything he has ever expereinced and the department of neurosurgery has been nurturing of all his ambitions. Dr. Sayour can be found taking trips from Tampa to San Francisco with his incredibly supportive wife and family. In addition to traveling, he enjoys spending time at local attractions including Gainesville’s museums and the Santa Fe College Teaching Zoo. As a Brooklyn native, he hasn’t quite embraced the outdoor life of the south and says he isn’t quite used to the multitude of alligators in all of Florida’s fresh water. He lives by new experiences and relishes in anything exciting. He considers himself to be a life-long learner, so it comes as no surprise that in an alternative life he would likely be an astrophysicist exploring the unknown. His interest in things beyond our reach is likely what drew him to cancer research in the first place. Dr. Sayour considers this research his life’s work. “These children fight so hard, I just want to do my part,” he says.